Heat honey, sugar and water until melted. Mix bakers ammonia with 1 cup of milk. Mix potash with 1 cup of milk. Mix all ingredients into a dough. Let stand in refrigerator for 3-4 days. Roll out as desired. Using a hook smoothen honey in the mixer. Add eggs, sugar and sorbex and whip until slightly airy and smooth. Mix bakers ammonia with milk. Add milk and the rest of the ingredients to the egg mixture and knead well. Rest overnight in the refrigerator. Roll out as desired. 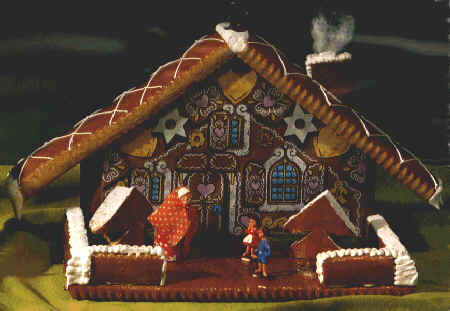 Make a gingerbread house! Follow our step-by-step instructions. Sorbitol is classified as a hexahydric sugar alcohol and is commercially available as a 70 % liquid (solution in water). Sorbitol will increase the smoothness of the dough and is also used to increase shelf live. Sugar alcohols, which include sorbitol, xylitol, maltitol, maltitol syrup, and hydrogenated starch hydrolysates, are found naturally in berries, apples, plums and other foods. They also are produced commercially from carbohydrates such as sucrose, glucose and starch. Most sugar alcohols are approximately half as sweet as sucrose; maltitol and xylitol are about as sweet as sucrose. As a group, sugar alcohols are incompletely absorbed and metabolized and consequently contribute fewer calories than other carbohydrates. An old-fashioned leavener. It gives off a noxious smell (phew!) while baking, but the odor dissipates by the time baking is complete, leaving extra-crisp cookies or crackers. Mix a 1/2 pound of powdered sugar with 1 egg-white and 1-2 teaspoon lemon juice.